However W’s return to work after christmas, coupled with baby!W being three months old and us having three months of parenting under our belts, adds up to a great opportunity to restart our morning walks. This isn’t a resolution, since it’s something we used to do all the time, and the only reason we stopped was that I just couldn’t manage the distance the more pregnant I got. And then, obviously we had a tiny baby to get our heads around. But now things are starting to settle down a bit it been lovely to throw on some clothes and bundle ourselves out of the door and out into the crisp frosty mornings. It carves out time to chat, a balance to the mad rush that the evenings can become. It’s always worth the effort. What a great idea. Did the minus temperatures this week make you almost change your mind? 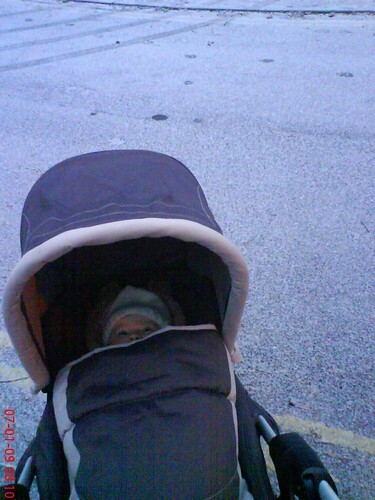 Only a tiny bit – and the just because I kow my walking boots aren’t great on ice, and I didn’t want to slip while pushing the pram. but thanks to my hardy northern childhood the cold holds no fear!